Exped specifically gave this backpack the Lightning name since it was created for those “Fast and Light” backpacking trips. The ultralight backpacker will really appreciate how big the bag seems for 60L, yet how lightweight it is. The Lightning 60 is well-known for being extremely comfortable, well-designed and ideal for multiple day excursions. It has an impressive load capacity weight limit but can easily be compressed down for lighter loads. This backpack really is an excellent quality, functional piece of gear that will make any backpacking aficionado happy. If you have a bit of experience with these kinds of activities and need a new backpack to function as a go-to bag for every season, the Lightning 60 should be on your list to check out. The Lightning 60 has some great features, with obvious attention paid to how this backpack was made. Here is a rundown of the sizing and buying options, materials used in construction and details in terms of design. Total capacity of 60 liters or 3,661 cu. In. Weighs only 2 lbs. 7 oz. load capacity of 53 lbs. 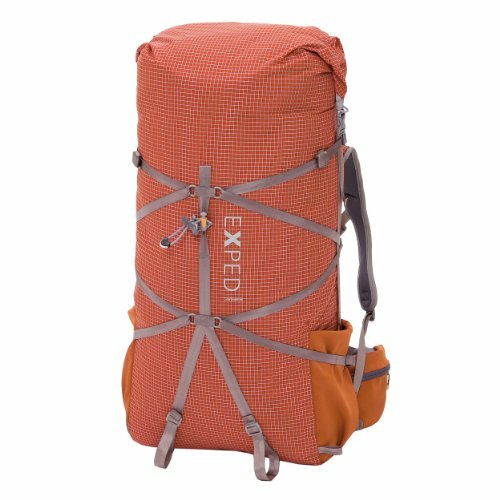 With solid 5 out of 5 star reviews on Exped’s website, as well as retailers, it’s easy to tell that this bag is not just a fan favorite, but a really an impressive piece of gear. There are a lot of little reasons that make the Lightning 60 so loved but here are three of the main reasons why backpackers appreciate this bag so much. Exped’s “T-Rex” suspension system sounds a bit strange but is an amazing feature that contributes to the comfort of this backpack. This system has two main features – breathability and load transfer to the body. The Lightning has very minimal body contact points which means the ventilation is astounding. There is nothing as uncomfortable as hiking in hot weather and having a backpack stick to a clammy back. The suspension system on this bag remedies that issues. Secondly, while the minimal back contact sounds like it would be less comfortable in terms of weight-bearing, it actually is far healthier for the back. The single aluminum stay is centralized and remains attached firmly to the hip belt. This allows you to carry the weight of the backpack more comfortably and for longer. Rather than having one giant C-curved zipper access to the main compartment, the Lightning 60 has top loading access in the form of a roll top. Not only does this make accessing gear much easier but it also offers better weather protection. Even the most water-resistant material backpack will fail unless the zipper is protected, since this is the weakest part. The rolltop makes it virtually impossible for water to get under the folds and into your gear. Since the backpack is also treated with a PU water-repellent coating, rain and snow isn’t going to be much of an issue for most situations. Most customers won’t have to used an additional rain cover unless they are going to be experiencing extended, heavy downpours or wet snow. Rather than having traditional mesh pockets, the Lightning has full fabric stretch pockets. This includes both the actual body and hip belt pockets. The lack of mesh is a great idea as it only adds to the ease of use of this bag. It’s frustratingly common for brush to get caught on mesh in backcountry hikes so full fabric panels eliminate this issue. Compress straps located on the sides and front of the backpack are a much appreciated touch. Compression straps have two major advantages – stabilization and reduction of size. By cinching down these straps you can better stabilize the load you are carrying. This prevents gear from moving around inside your back which only works against your movement as you hike. As for reduction of size or actual compression, the straps allow you to shrink your bag down to a smaller size if you aren’t carrying enough gear to reach full capacity. This makes the backpack more versatile. Like every good backpack, the Lightning 60 is hydration compatible. There is an inner pocket for the reservoir (sold separately) which can be accessed externally, meaning you won’t have to open your backpack just to get the reservoir out. The bag also has ports for the drinking tube. Additional features like gear loops for ice tools or poles is a nice touch. Out of all the numerous positive reviews for the bag, there are two downsides to it. Neither affects the bag too much but are still worth considering if you are doing comparisons shopping between this model and another. This backpack is made of a tough ripstop nylon but some backpackers have experienced weakness in the fabric. This usually occurs in two areas – the body of the bag and the compression straps. 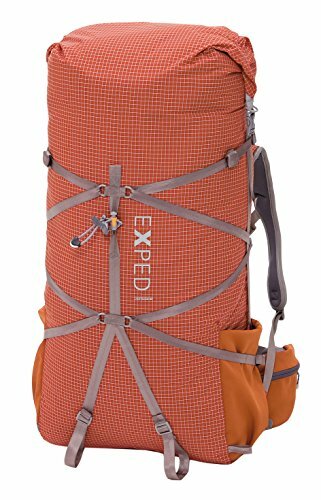 The body of the bag is on par for most backpacks of this type but since Exped naturally had to reduce material thickness to reduce weight, it seems as though packing this bag through very difficult brush or rocky areas that result in scraping can take a toll. You’ll likely see damage sooner than heavier backpacks. Secondly, if you use compression straps very often or are in the habit of really cinching straps down extremely tight, you’ll likely see wear here too. This is more of a user error as abusing the straps will of course result in damage, but it’s still something to keep in mind if you tend to do this with other backpacks. The Lightning 60 retails for $229 (check this listing for the latest live prices) by Exped. This is definitely not a budget-friendly backpack for most people, especially those new to this activity. You could likely find a comparable 60L ultralight backpack for $75 to $100+ (check this listing for the latest live prices) less than this. 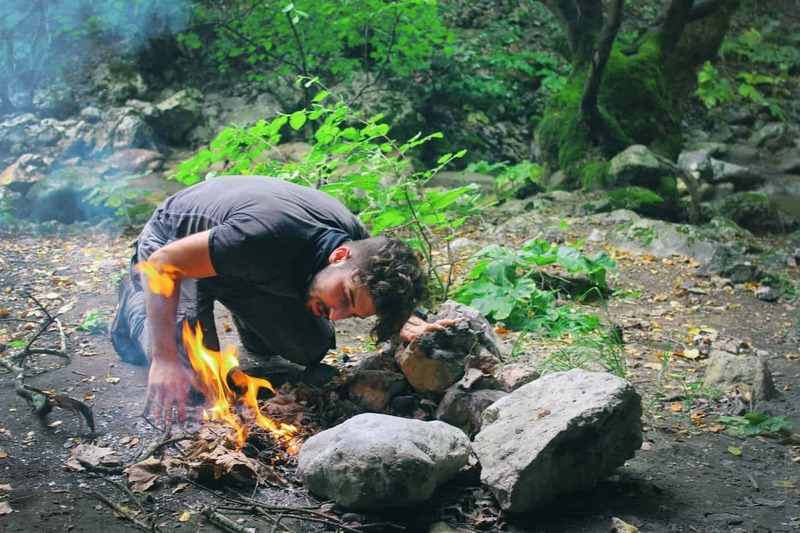 Any experienced backpacker will tell you that going by price alone is a mistake, and this is true. You will get a very good quality backpack for this price and it could very well be far more comfortable than cheaper models. Typically price correlates to quality and this is true for the Lightning 60. Overall the Lightning 60 is great backpack with some really neat features and little details. It can hold a massive amount of gear, with a maximum weight of 53 lbs. which is astounding for a bag only weighing 2 lbs. 7 oz. empty. You can treat this like the ultralight backpack it is or really fix it to capacity for those long trips into nature or even traveling. If you have a decent budget set aside for a backpack, the Lightning 60 is definitely one to consider.